Many of you know that last week I gave my first ever pitch. I've been working hard on becoming a better writer, and reading up on what I can about the publishing industry. But I've never taken that leap -- the one where I actually get my name out there and try my hand at a query. Before I go any further, let me just say that I don't find it prudent to put up details of my pitching/querying experiences up until something is definite, but I do want to share one thing I learned from this pitch -- Never Stop Believing in Yourself. It is so easy to think about how many other books are out there, how many talented authors there are and get overwhelmed. To think you're not good enough is the easy path, the hard path is working through your short comings. Here's the truth, if you don't ever give yourself a chance you'll never reach your goals. Even in rejection, even when we dig harder to improve we can find something about ourselves that we still like. 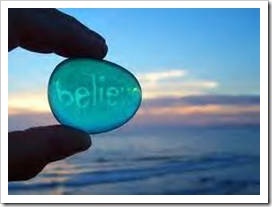 The fact remains that if we don't have any belief in ourselves we will never accomplish anything. You are stronger than you think. I am stronger than I think. We can be strong enough to conquer the tallest mountains and overcome all of our obstacles. That's it, that's all you need to know. Work hard then have confidence in what you've accomplished. Becasue there is always tomorrow and there is always the chance to be better. My main problem is that sometimes I just don't feel supported, and that makes writing that much harder. And often it's that attitude, that can-do feeling, that drives our work to where it needs to be. You go, girl. JA, you're amazing. Contests on taking steps in the right direction. If you ever want to do query/pitch work together, let me know :) (I'm not sure how much help I'll be but I learned a lot at PNWA). That's why I love blogging. Because when we fall down and forget to believe we're strong, we've got others to tell us we are, and we get back up. This is a great post. I feel like I've gotten a very necessary pep talk and well, I'm ready to tackle a new story idea dangling in my head. You're awesome Jennie! I needed this today! Seriously. Yesterday I was feeling so low, but I'm started to feel motivated again. Thank you! This is so great to remind ourselves. We are stronger than we think and we can handle it. Even when things get hard. I so needed this today. Thank you! Great post and something I definitely needed to read. I keep telling myself I'm awful. I can't do this. Blah blah. But you know what? I can do this. This is my third novel. My first is about to be published. We all fight these demons at some point in our writing career, but it's pushing THROUGH these tough times that make us who we are. Good luck to you! You just make me happy. Great point. Sad but true... C'est la vie! That's why I'm running away for a minute! Wise words! The only person in our way is ourselves. Getting my first rejection letter, for me was actually a good thing. It meant that I wrote my book and believed in myself and my writing enough to submit it. That I need to keep working on improving my query letters. And last but not least, to keep learning! thanks for the encouraging words. need a boost sometimes! That's been my mantra with all the crazy changes I've had in my life this month. Writing has been the bottom of my to do list and that's hopefully going to change soon so I can go back to feeling less story itching in my imagination. Thanks for this wonderful and encouraging post. You're right; it's incredibly easy to think of all the other writers, all the other books, and to doubt yourself. I know I've been caught up in that before.